Heavy Machinery Movers- 8000 lb capacity per pair! 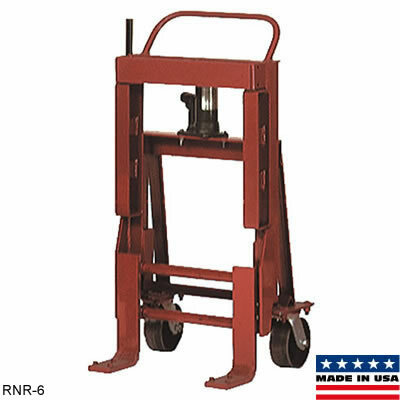 The Rais-N-Rol by Wesco is used in pairs of 2 and is intended to move extra large bulky items such as machines. 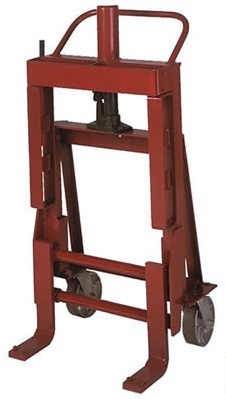 It has swivel casters which allow for movement in any direction and has a hand operated hydraulic jack for easy lifting and controlled lowering of loads. The Rais-N-Rol comes with built in hooks for the optional Load Binder Accessory, which is two 12' long nylon belts with heavy duty ratchet tighteners and is highly recommended for stabilizing large loads. The Load Binder Accessory comes in 2 styles, part #260096-Delta Ring Style Hooks or part #2600147 "E" Track Style Hooks. Inside Fork Span Range: 6" to 19.5"